← W. Redvers Dent’s “The Original” (1930)…. Will R. Bird’s “Heap Bad Medicine” (1927)…. This is the third in an ongoing series where I’ll be posting PDF’s from my collection of WWI era pulp magazines. Today’s story is one of Will R. Bird’s very early efforts, Heap Bad Medicine from the November 10th, 1927 issue of War Stories. 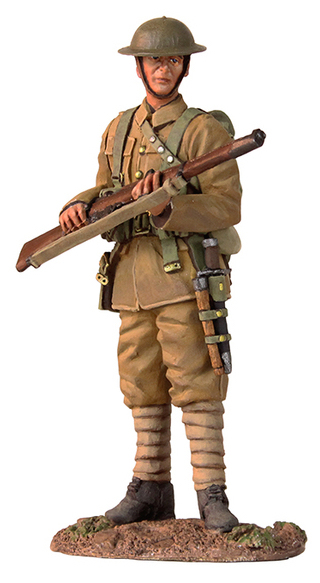 The story centres upon two privates in the “25th Canadians” (the Nova Scotia Rifles, though they’re not referred to as such) –“Scotty” MacBeth, a hard drinking Scot with a charge sheet as long as your arm, and Isaac “Eagle Eye” Knockwood, the battalion sharpshooting ace from the Micmac Indian tribe. Ordered to the Major’s dugout, MacBeth notices some brass hats carrying two bottles of premium Scotch Whiskey into the officer’s shelter, and he and Eagle Eye start scheming on how best to relieve them of it. After being given orders to venture out into no man’s land to deal with a sniper who had notched five kills in their sector, Eagle Eye “accidentally” drops a smoke grenade in the dugout, our heroes make off with the bottles, and they head out on their mission. As one might imagine, much chaos ensues, interrupted by a barrage of clichés. 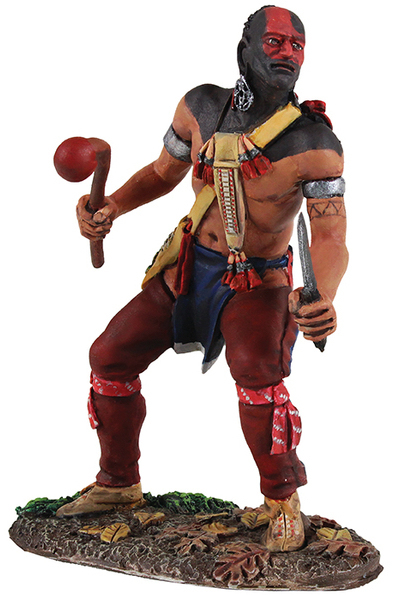 Eagle Eye is naturally a stoic fellow, prone to grunting his approval when he’s not speaking in broken English about the mighty warriors in his family and the scalps hanging from the ancestral wigwam that prove it, and though he’s “the best shot in the battalion” he “could get drunk the quickest and easiest of any man in uniform.” Oh, dear. But it gets w orse: naturally the two men take a prisoner, and Eagle Eye wants to scalp him. Only through his white man cunning does Scotty prevent this by having his Indian comrade swear an oath and kiss a bible, before his red friend tucks into the better parts of two bottles of Scotch. Yikes. I was really, really hoping that the story was going to turn here, and that Bird was going to make some remark about the savagery of the war, man’s inhumanity to man, the assumptions of advanced civilizations vis-à-vis “primitive” ones –in short, anything that could have justified the preceding nonsense. But no. The story closes with Eagle Eye losing the prisoner they managed to secure earlier and, roaring drunk, he war-whoops into no man’s land. There’s no two ways about it: this is probably Will Bird’s weakest story of the war, and there’s not much to redeem it. Though scornful of drinking men in And We Go On, Bird saw the humourous potential in besotted characters, and uses them to some effect later on in his “Clancy” stories that appeared in the Toronto Star. Unfortunately we don’t see much of that here. 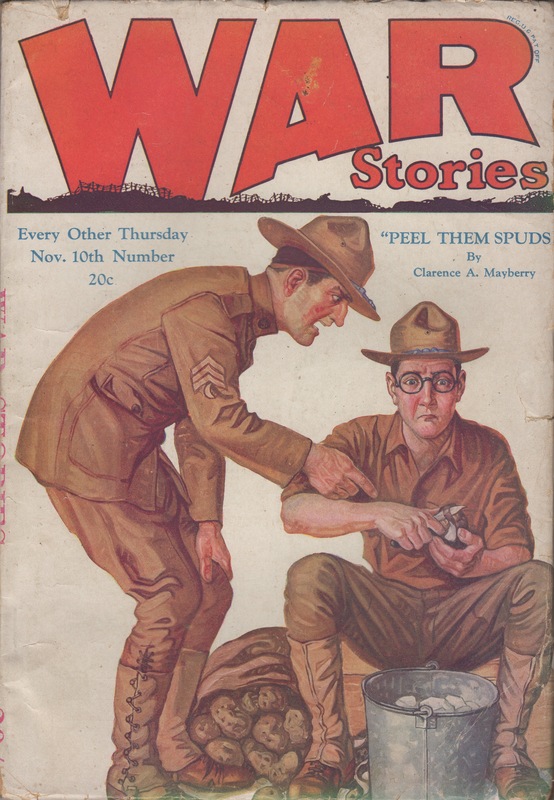 As was his wont, Bird republished the story a couple of years later under a different title, Delirious Tree-Men, in the June 1929 issue of Canadian War Stories. I haven’t seen the later incarnation, but based on other examples where stories of his were republished elsewhere, I suspect it’s more or less unchanged. I’ve cleaned up the images a bit. The PDF is below the cover image. Enjoy….? This entry was posted in Uncategorized and tagged Canadian War Stories, First Nations, Pulp, War Stories, Will R. Bird. Bookmark the permalink. 1 Response to Will R. Bird’s “Heap Bad Medicine” (1927)…. Fascinated by your comment that “As was his wont, Bird republished the story a couple of years later under a different title, Delirious Tree-Men, in the June 1929 issue of Canadian War Stories.” and wondered where you got that information from as the Will R. Bird bibliography doesn’t mention it. I’m trying to index CANADIAN WAR STORIES and would love to know of any other retitled reprints you know of.